SHANGHAI: If you build this, they will come. Hillary Clinton, the United States secretary of state, refashioned yesterday a line from the US movie Field of Dreams to urge American companies to sponsor the country's pavilion at next year's World Expo in Shanghai. The structure of the USA National Pavilion was completed last month, three months after the world's largest economy confirmed its participation in the expo following arduous fundraising efforts. Construction of the structure was done in no time - it usually takes half a year to finish a 6,000-sq-m pavilion, one of the largest at the Shanghai World Expo. With the building in place, Clinton, in her second visit to China as secretary of state, is hoping more investors will contribute another $20 million to meet the $61 million budget of the pavilion. "Boeing has just agreed to double its contribution to $2 million," she said. "I know there are some in the audience that are still contemplating sponsorship, or may be in negotiations with the USA team. Now is the time to join this effort; we want to assemble the strongest team of partners possible," she said. And she wants more visitors, too. "We are building it, and we believe when the expo opens in 166 days, 70 million people will come. And with this rain today, maybe 100 million, and with that even greater good fortunes." 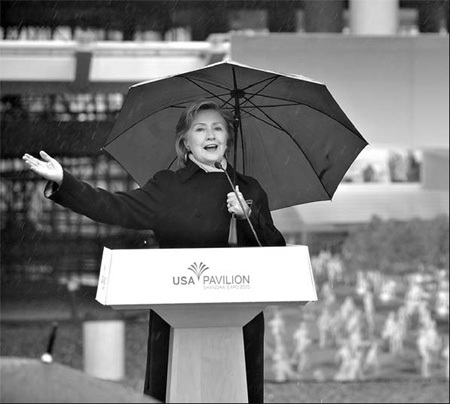 The secretary of state made the remarks at the construction site of the US pavilion in the Expo Garden in heavy, cold rain, described by Shanghai Vice-Mayor Yang Xiong as "rain of good fortune" in line with a Chinese tradition. According to US laws, all funds for US participation in the expo should come from the private sector. But companies are reluctant to dip into their pockets amid the economic crisis. At one point, some critics thought the US may miss the Shanghai gala. But since technology giant 3M became the first sponsor in March, companies such as PepsiCo, General Electric and Yum! Brands have signed on. The US agreed to join the expo in July, the third to last nation to confirm among the 242 participants, followed by World Trade Organization and Shanghai Cooperation Organization. The country experienced a similar funding difficulty in 2005, when its participation in the Aichi expo came true only after Japanese companies such as Toyota Motor North America became sponsors.